On Saturday, Rep. Michele Bachmann (R-Minn.) became the first GOP presidential candidate to sign a pledge from an anti-immigration group Americans for Securing the Border. Per the group’s website, the pledge compels Bachmann to complete a 2,000-mile-long fence, from San Diego to Brownsville, by December 31, 2013—or 11 months into her hypothetical first term in office. It would be a double-fence, because sometimes one fence just doesn’t cut it, and it will be, Bachmann says, contiguous: “It will be every mile, it will be every yard, it will be every foot, it will be every inch of that border, because that portion you fail to secure is the highway into the United States.” On Tuesday at the GOP presidential debate in Nevada she doubled-down on the pledge. As you can see, a reinforced double-fence with razor-wire and lions or what have you would be, like, the seventeenth most daunting barrier to getting from one side to another. Even in the portions where the river isn’t hemmed in by towering sandstone cliffs, there are other problems. 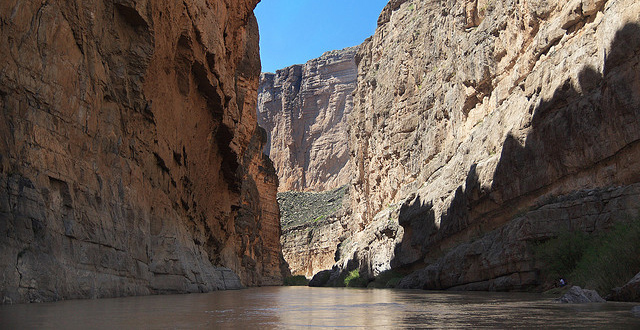 Building a fence along the Rio Grande floodplain would essentially turn the structure into a dam when the river spills over, and could potentially alter the course of the river itself—which in turn would alter the border, and put the United States in violation of the international treaties.